Some pointers to note:- To be on time and we will wait 15mins for the late-comers. - Do head court before we set-off. - Please inform the facilitator if you need to leave the group. - Keep within sighting distance of each other. Pls shout 'a-o-nah' if you can't see the pp inform or behind you. - Look out for one another. - Trail courtesy at all times. 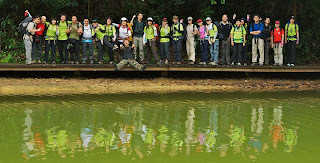 so for this hike 4, we all set off with a min 12kg backpack, and went by the 5km nature trail. 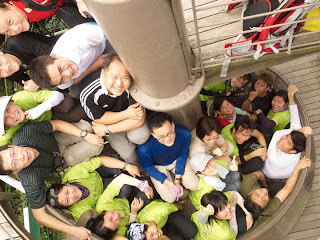 after the lovely tree top walk, we went up the Jelutong tower to take group photos at the top. We walked back to the MacRitchie visitors' centre via the usual jogging route past the golf course. it was a rather peaceful hike, at an enjoyable pace. we ended early and started on ropework 4.
for ropework 4, we learnt the Alpine Butterfly, and Bow Line. after this BOAT session, most of us went in 5 cars to commonwealth cresent for ice kachang and tzi char together. i think i'd really miss BOAT after graduation.